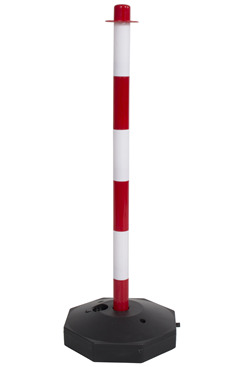 If you're looking for a cost-effective way to safely secure a work area or restrict access to hazardous zones, our collections of Posts and Chains may be the perfect thing! Here at Life-Gear.com, we supply high-quality protective equipment that aims to keep you, other workers and the environment that you work in as safe as possible. One great way in which you are able to do this is with chain posts! The ability to implement and maintain high safety standards is essential, especially in today's society. Failure to comply with safety regulations can have some serious consequences for companies and workers, leaving both individuals and workplaces at risk. A great way in which you can improve safety conditions in the workplace is with post and chain sets that clearly indicate an area that is restricted and should not be accessed. One of the benefits of our collection of chain posts is the ease of use that comes with them. 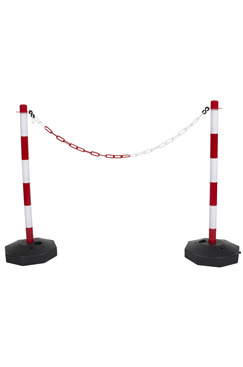 Whether they are required for an hour to cordon off a slippery surface after a spillage or for days at a time to keep people from entering an area with falling debris, a post and chain barrier can come in handy at any time. When not required, chain posts can be easily removed and need very little storage, another reason why they prove to be a fantastic safety measure! Whether you need a set of posts, chains or both, Life-Gear have an extensive collection that is sure to match your requirements. With individual items or matching sets, we are confident that our post and chain barrier range will be more than enough to meet the safety needs of your workplace. Below are some of the posts and chains that we have to offer! As you can see, whether you're in need of individual components for a post and chain barrier or a complete set, we are able to provide! Our chains are available to purchase in various lengths (6mm & 10mm) to accommodate a variety of spaces as well as a black and yellow colour option also available to create a more eye-catching safety measure. 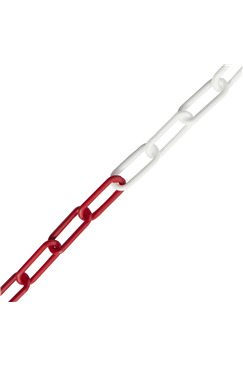 To browse our entire range of Chain Posts, click the button below to visit our Ladders, Posts and Safety Barriers category. For more information of our Post and Chain Barrier range or for any assistance with your order, please do not hesitate to get in touch with a member of our team today by calling 0117 9381 600 or emailing sales@life-gear.com.